As hurricane season progresses, we are preparing for disaster relief response with Operation BBQ Relief, should we be needed. Please consider stocking up on basic supplies, should your family or your neighbors need assistance. Much of the anxiety felt leading up to a storm is due to stores being low on supplies and residents being unprepared. Buying supplies last minute can also create further financial stress. Remember that after a major disaster, a loss of power can last weeks. Pulling a trailer, whether it is large or small, requires a regular review of the equipment, including the hitch and signals, as well as some extra safety and clearance precautions to ensure a secure drive. Many states require trailers to drive in the slower right hand lanes; check your state’s Driver Handbook for details. Trailers require extra stopping room. It also requires forethought when changing lanes, making turns, and backing up. In general, you should be aware of where you are driving with a trailer, and avoid a situation where you might be stuck, or have to back up a long way. First, check the hitch. For a regular ball hitch, the tongue on the trailer should be properly attached to the vehicle hitch, with the locking mechanism snapped and lock pin in place. If the hitch isn’t secure, it could off and go through someone’s windshield. A trailer connection to a vehicle should also have two chains, crisscrossing in an X shape, between the vehicle and the trailer. Check the connection by pulling up on the trailer to try to pull it off the hitch, which you shouldn’t be able to do. If you can pull the hitch off, it must be reattached. Also check the clearance of the connection, and make sure any wheel or stand for the trailer is in the up or drive position. It is very important that the brake lights work on the trailer. Otherwise, motorists are unable to tell when you are slowing (and in the dark, they won’t be able to see you at all). If the trailer and hitch connection is good, and the trailer signals are working, you’re ready to drive. Check out this month’s Safety Video with Scott Guy & Mark Lambert. stay compliant. stay aware. stay safe. Before you hit the highway, though, make sure you’re familiar with driving your vehicle-trailer combination. A good way to get used to maneuvering, including some practice backups, is to drive in an open parking lot, or at least a familiar area. Backing up can be especially difficult; try turning in the opposite direction you want to go. So if you want the trailer to go right, turn the wheel left. The most difficult part of trailer driving for many motorists is making turns. While it does not seem like there might be a need for it, drivers pulling trailers must overshoot their turns, taking them wide enough so that the trailer’s path does not put it off the road or in contact with telephone poles or other street-side obstacles. Cutting a corner with a trailer will put the trailer, as well as pedestrians, other drivers, and yourself, in danger of collision. If you start a corner too tight and get into trouble, stay calm and stop. Make sure the roadway behind you is clear, back up a little bit, and take the turn again wider. It will probably be the last time you cut a corner with a trailer! Also be aware of the size of your trailer―what is the clearance? Could you drive it through a 12-foot-high tunnel? What-ever’s on the trailer must be securely fastened down, to prevent debris and other safety hazards. Remember that the larger the load, the longer it will take you to stop. Keep an extra safe distance behind cars in front of you, and test the stopping power of your vehicle and trailer before you have to stop suddenly, so you know what you’re dealing with. Make sure you are within your vehicle’s towing capacity. Some large trailers have a braking mechanism that helps slow the trailer along with the vehicle. The bottom line is to use caution and slow down. The other big thing to avoid when pulling a trailer is what is called “jackknifing.” Named for the position of the vehicle and trailer, this is most common when backing up with a trailer. It is basically a situation where the angle between the vehicle and the trailer it is pulling is less than 90 degrees, or beyond an L shape to a V shape. Avoid this by never letting the trailer position get beyond the L shape. When reversing with a trailer, just take it slow and get a feel for the trailer. Keep your movement of the steering wheel to a minimum, and remember, you can pull forward to straighten out, so if you are struggling, just start over. Jackknifing will damage the hitch and trailer, so be aware of it. Our friends at FEMA Federal Emergency Management Agency put together a Hurricane Awareness and Preparedness video. It’s easy to follow and a great tool to show younger children so that they know what to do in the event of a hurricane. Get the kids involved! 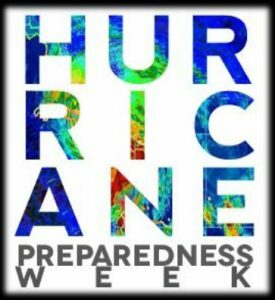 www.ready.gov has put together some terrific resources to help you prepare your children for a hurricane. Be sure they are ready to play their part.